The only gate of the original medieval fortification which is preserved to this day, Michael's Gate can be seen from all over the city! The gate was used for entry into Bratislava and has a 51-meter-tall tower with a foundation that is around 700 years old. The statue of St. Michael and the Dragon on top of the gate to represent their protection to the city. ‘Zero kilometer’ metal map beneath the gate which shows different distances to nearby cities. How popular is Michael's Gate? People normally club together Man At Work- Cumil and Old Town Hall while planning their visit to Michael's Gate. A beautiful part of the medieval area, lots of independent shops around selling handmade crafts and souvenirs, not as tacky as you'd imagine. A great walk with lots of cobbled alleys and beautiful historic architecture. A must see in my opinion! 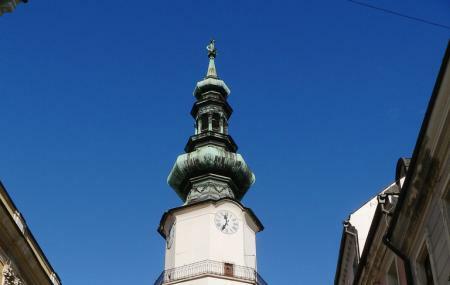 Bratislava is one of the city I visit that keeps most early buildings, without too much modern retrofit. I appreciate that. But some how on the ground, they made a compass that marked the distance and direction of few modern cities. It's interesting, tourist will feel excited at first minute, but confuse in the next second, is this compass old or newly build? People here want feel the history, since it's old city area. Keep it that way. However, if you are not that insist thing shall be kept like old time, it's really an interesting land mark. Within couple of squares too much detail to focus on. Every step you feel the Old Town. Enjoy your time and please attention to every inch. Sometimes, around the corner you may find a spectacle or a baroque music performance as well. Great view from the top. You can see much of the old town skyline and the castle and ufo bridge. Interesting and very well priced weapons museum.